The P865 models debuted on Metro’s Blue Line when it opened in July 1990. 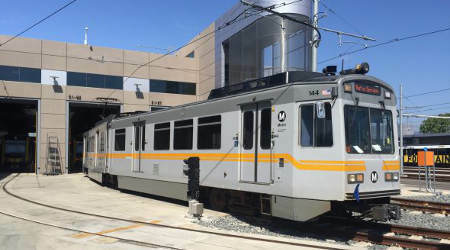 The Los Angeles County Metropolitan Transportation Authority (Metro) next month will retire its remaining P865 light-rail cars. Manufactured by Nippon Sharyo, the P865 models debuted on Metro’s Blue Line when it opened in July 1990. The agency has 54 of the cars. Later this month, Metro will retire light-rail car No. 144, which will be trucked to its new home at the Orange Empire Railway Museum in Perris, California, agency officials wrote in a blog post. During its 28 years of operation along the Blue and Expo lines, that unit logged more than 1.8 million miles of service. Metro is replacing all P865 units with Kinkisharyo P3010 cars. The agency began retiring the older model cars in June 2017. Meanwhile, 15 identical P2020 class cars will continue to run along Metro’s rail lines for another five or six years, Metro officials said.